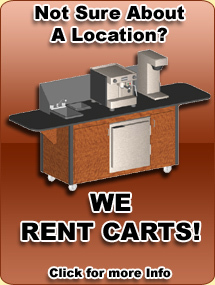 This is the smallest espresso cart available with a full size 6.5 cu Ft Beverage Air refrigerator. Combine that with a 30A 220v electrical system, complete water system with hand sink, and our heavy duty steel frame construction, and you have a lean mean vending platform ready to earn you money! 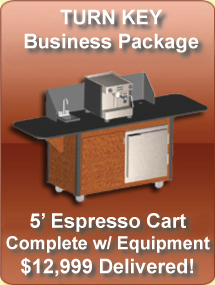 • Complete 5 espresso cart with 30A 220v electrical system. • Espresso Accessory kit (2 espresso shot pitchers, 2 milk steaming pitchers, knock box, Stainless tamper, 2 Shakers, 2 Bar spoons, and a Cleaning kit.